“They’re just steel silhouettes, but instantly recognizable, an iconic lineup of four figures striking familiar poses with their instruments. Revelers passing through this busy intersection on Hamburg’s so-called “Sinful Mile” gravitate toward them, posing for photographs alongside the Fab Four: John Lennon, Paul McCartney, George Harrison and a drummer that represents both Ringo Starr and original percussionist Pete Best. “I was born in Liverpool, but I grew up in Hamburg,” Lennon once said, referring to the more than 300 nights the Beatles spent playing in clubs along the notorious Reeperbahn red-light district of this north German port city in the early 1960s. This year marks the 50th anniversary of their most famous residency, or series of gigs, at the legendary Star-Club, which means that even more Beatles fans are flocking to the area than usual. And Beatles-Platz, a circular plaza designed to resemble an old vinyl record, with the steel statues standing to one side, is where they congregate. I’ve been listening to the Beatles since I was a child, their songs part of the soundtrack to my life, and joining the pilgrims at Beatles-Platz, I feel almost as if I’m meeting my heroes. 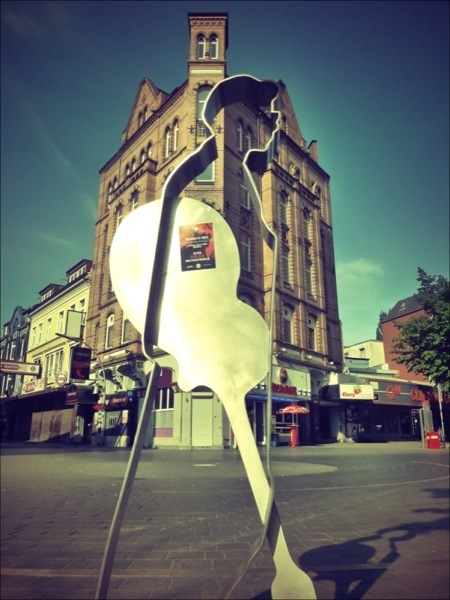 But instead of the Fab Four, I find myself drawn to a fifth statue that stands a few yards away, walking toward the others, bass guitar slung low. No visitors are clamoring to have their pictures taken beside this figure, which represents Stuart Sutcliffe, the band’s original bassist. Even here, attention eludes the lost Beatle. In case you haven’t heard of — or have forgotten about — him, Sutcliffe gave up his role in the band in 1961 to study art and live with his fiancee, the photographer Astrid Kirchherr, one of a number of young Hamburg artists called the Exi’s whom the band befriended. I find the sight of his silhouette, standing on the fringes of the legendary lineup, oddly touching. It’s a snapshot of a life that took a tangent and met with tragedy: Sutcliffe would never see his former bandmates change the face of popular music, as he died of a brain hemorrhage in April 1962, aged just 22. From my piece on the streets of St Pauli where The Beatles became the band that changed the face of popular music. Read the rest of this article at The Washington Post. The Canadian music scene just keeps producing essential bands, but instead of the dense sound and sprawling line ups of Broken Social Scene or The Arcade Fire, Final Fantasy is all about one man and his violin. Owen Pallett might have arranged the strings on The Arcade Fire’s “Funeral”, but it is as Final Fantasy that the classically trained violinist is making his mark on “Can-rock”. This performance was another presentation by Foggy Notions, and Pallett was appropriately preceded on stage by the ridiculously talented Dublin Guitar Quartet, who play classical music by the likes of Philip Glass on electric guitar. 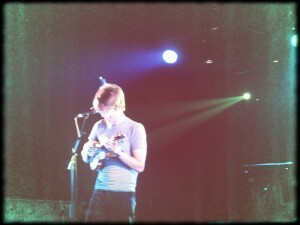 Pallett, on the other hand, plays gorgeous pop music with one violin. He sounds like a one-man string section, however, using a pedal-controlled sampler to loop elements over each other, building the components and his warm vocals into intricate, scintillating songs. He certainly has no shortage of sumptuous songs to play. His debut album “Has A Good Home” is filled with achingly beautiful melodies such as “This is the Dream of Win and Regine” and “The CN Tower Belongs to the Dead”. His just-released second album, the bizarrely titled “He Poos Clouds”, is an even more consistent piece of work, featuring a string quartet throughout. Pallett was joined for some songs by a drummer called Philip (“We got him in Cologne,” explained Pallett. “They sell drummers on the streets there. I paid top dollar for him”), which added texture to the Final Fantasy sound. The other “instrument” was a humble overhead projector, standing to one side of the stage, evoking classrooms and scribbled lecture notes. When Steph the projectionist turned it on, however, she treated the audience to a whimsical puppetry display, full of medieval fairy tales, floating violinists, castles, kings, kites and kissing couples, with chapters called things like “Final Fantasy as Orpheus” and “Journey to Hades”. It was very probably the first time an overhead projector and a violin achieved such unity of purpose, but after this performance, no string quartet should be without one. 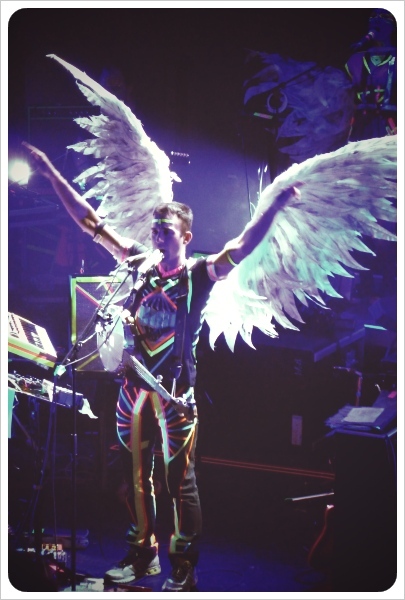 Had the extreme pleasure of seeing Sufjan Stevens do his extraordinary stuff at the Olympia during the week, during which he out-Wayne Coyned any Flaming Lips show I’ve ever seen. The review of this week’s show can be read here, but it was quite the contrast to the first time I saw him, a much more conventional gig in The Village more than five years ago – back when he could accurately be described as a singer-songwriter. “Dressed in an Evel Knievel-style stars ‘n’ stripes jumpsuit, and with a six-piece band in cheerleader outfits, it’s quickly apparent that Sufjan Stevens is not your regular singer-songwriter. Though he may be lumped in with the New Weird America scene along with Devendra Banhart and Joanna Newsom, Stevens is very much doing his own thing, that thing being the much-touted “50 States Project”, albums inspired by every state in the Union. He and his band, the Illinoisemakers, began with the raucous 50 State Song (“It’s the start of the act, the 50 states, pack up your bags, it’s time to escape“), setting the tone. His wildly reviewed and wildly ambitious Illinois album, the second in the project, formed the bulk of the setlist, with a few detours to his native Michigan, but it is far more than gimmicky Americana that Stevens has to offer. Delicate harmonies, gorgeous melodies and infectious hooks infuse songs about places such as Peoria and Decatur. A banjo squealing with feedback and some other muted sounds meant the music couldn’t match the crisp harmonies that Stevens achieves on record, and it was the down material, as he called it, with just Stevens, his guitar and the voices of his band, that translated best to the stage. A haunting John Wayne Gacy Jr, about the notorious serial killer, was particularly affecting.